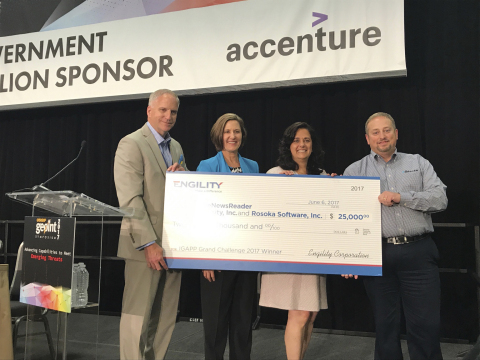 CHANTILLY, Va.--(BUSINESS WIRE)--Executives from Engility Holdings, Inc. (NYSE:EGL) - named Optensity and Rosoka Software the winners of the 2017 Innovative GEOINT Application Provider Program Grand Challenge, an annual contest that challenges application developers to create a technology solution that addresses critical needs facing the Department of Defense and Intelligence Community. The winners were presented a $25,000 prize on the Government Pavilion Stage at GEOINT 2017 in San Antonio, Texas by Robert Cardillo, Director of the National Geospatial Intelligence Agency, and Amanda Brownfield, Engility’s Senior Vice President, Intelligence Solutions Group. Demonstrations of the winning application are being held at the show through June 7 in Engility’s Booth No. 1241. The theme of this year’s Innovative GEOINT Application Provider Program challenge was to build a solution for effective global news aggregation, which enables defense and intelligence analysts to maintain situational awareness of current events around the world or for a specified area of interest. Optensity and Rosoka Software’s GlobeNewsReader app won the competition by meeting mission, user-experience and functionality requirements. GlobeNewsReader is now available for iOS and Android at the GEOINT App Store (apps.nga.mil), NGA’s online storefront that provides downloadable applications for mobile and desktop devices. Managed by the National Geospatial-Intelligence Agency, IGAPP is a revolutionary contract vehicle that bridges the gap between Department of Defense and Intelligence Community users and commercial app developers. Engility acts as a trusted broker for IGAPP, managing the process that allows vendors to enter the government market and deliver innovative solutions quickly in support of user missions. IGAPP-approved vendors gain access to NGA data sources, subject matter experts and outlines of mission-specific app needs. Engility provides vendors with direct expertise to shape, develop and improve apps to better fit user needs. The company also connects vendors with the infrastructure to build and test all applications to ensure they are secure, perform well, function properly, and don’t violate intelligence oversight before their release to the GEOINT App Store. If you are interested in participating in IGAPP to deliver apps to government users, go to www.igapp.com and register to begin the approval process. Hosted and produced by the U.S. Geospatial Intelligence Foundation, the annual GEOINT Symposium is the nation’s largest gathering of industry, academia and government to include Defense, Intelligence and Homeland Security Communities as well as commercial, Fed/Civil, State and Local geospatial intelligence stakeholders. For more information, please visit www.engilitycorp.com/GEOINT17. Engility (NYSE: EGL) is engineered to make a difference. Built on six decades of heritage, Engility is a leading provider of integrated solutions and services, supporting U.S. government customers in the defense, federal civilian, intelligence and space communities. Our innovative, highly technical solutions and engineering capabilities address diverse client missions. We draw upon our team’s intimate understanding of customer needs, deep domain expertise and technical skills to help solve our nation’s toughest challenges. Headquartered in Chantilly, Virginia, and with offices around the world, Engility’s array of specialized technical service offerings include high-performance computing, cybersecurity, enterprise modernization and systems engineering. To learn more about Engility, please visit www.engilitycorp.com and connect with us on Facebook, LinkedIn and Twitter.